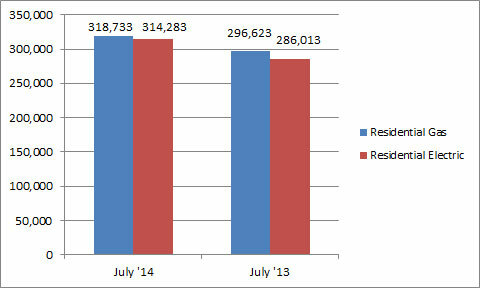 U.S. shipments of residential gas storage water heaters for July 2014 increased 7.5 percent, to 318,733 units, up from 296,623 units shipped in July 2013. Residential electric storage water heater shipments increased 9.9 percent in July 2014, to 314,283 units, up from 286,013 units shipped in July 2013. For the year-to-date, U.S. shipments of residential gas storage water heaters increased 3.7 percent, to 2,591,340, compared to 2,500,077 units shipped during the same period in 2013. 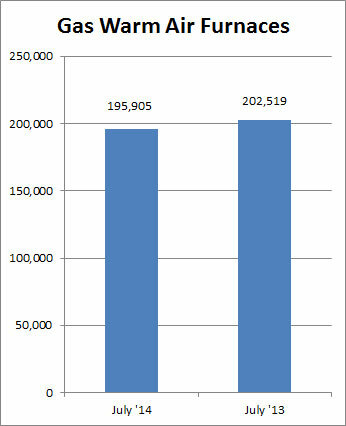 Residential electric storage water heater shipments increased 5.8 percent year-to-date, to 2,474,912 units, compared to 2,338,923 units shipped during the same period in 2013. Commercial gas storage water heater shipments increased 1.2 percent in July 2014, to 7,128 units, up from 7,043 units shipped in July 2013. Commercial electric storage water heater shipments increased 8.1 percent in July 2014, to 6,122 units, up from 5,665 units shipped in July 2013. Year-to-date U.S. shipments of commercial gas storage water heaters increased 5.0 percent, to 56,841 units, compared with 54,126 units shipped during the same period in 2013. Year-to-date commercial electric storage water heater shipments increased 10.6 percent to 43,901 units, up from 39,687 units shipped during the same period in 2013. U.S. shipments of gas warm air furnaces for July 2014 decreased 3.3 percent, to 195,905 units, down from 202,519 units shipped in July 2013. 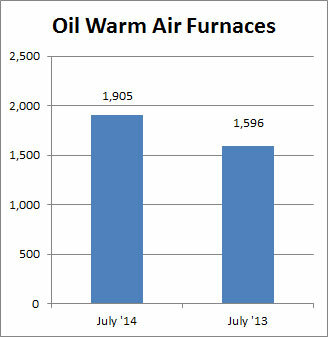 Oil warm air furnace shipments increased 19.4 percent, to 1,905 units in July 2014, up from 1,596 units shipped in July 2013. Year-to-date U.S. shipments of gas warm air furnaces increased 4.2 percent, to 1,426,426 units, compared with 1,368,297 units shipped during the same period in 2013. Year-to-date U.S. shipments of oil warm air furnaces increased 6.4 percent to 14,237, compared with 13,380 units shipped during the same period in 2013. U.S. shipments of central air conditioners and air-source heat pumps totaled 710,279 units in July 2014, down 1.6 percent from 721,979 units shipped in July 2013. 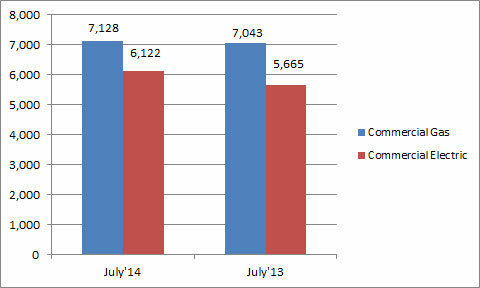 U.S. shipments of air conditioners decreased 7.4 percent, to 483,850 units, down from 522,289 units shipped in July 2013. U.S. shipments of air-source heat pumps increased 13.4 percent, to 226,429 units, up from 199,690 units shipped in July 2013. 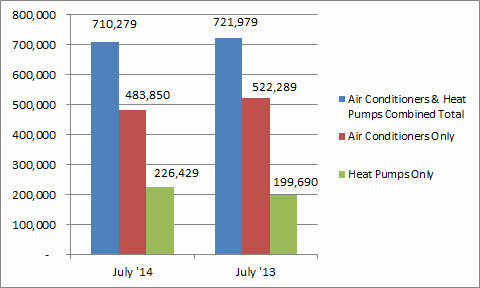 Year-to-date combined shipments of central air conditioners and air-source heat pumps increased 6.6 percent, to 4,541,415 units, up from 4,259,917 units shipped in July 2013. Year-to-date shipments of central air conditioners increased 2.9 percent, to 3,016,398 units, up from 2,932,810 units shipped during the same period in 2013. The year-to-date total for heat pump shipments increased 14.9 percent, to 1,525,017 units, up from 1,327,107 units shipped during the same period in 2013.